We built this editor from the ground up using the latest technologies and it is probably the most ambitious piece of software we’ve ever worked on. 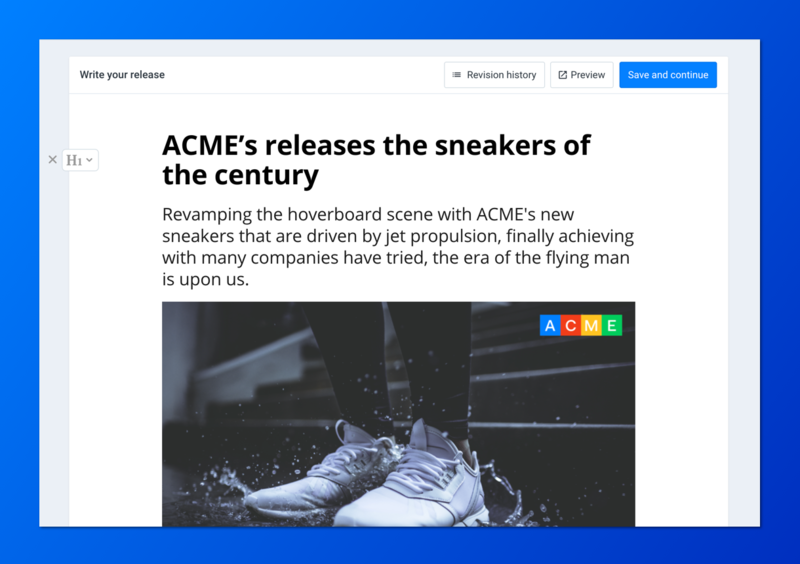 The editor will become the primary way of writing content in pr.co, so you'll be able to write news releases, emails and more in the future. The new freeform editor now has a cursor throughout the whole document, instead of only in editable text fields. This way you can easily navigate through the content and remove or create new content right on the spot. If you'd like to remove a piece of content, just place just cursor on the content and hit the Backspace ⌫ key. Alternatively you can also click the Delete icon on the left of the Menu button in order to remove a block of content. With the original freeform editor you had to frequently switch between your keyboard and mouse, even when you were just typing a long piece of text. With the new editor we changed this so you can now just keep on typing and only need to use your mouse when trying to create other blocks than the default text block. After writing a paragraph just hit Enter ⏎ in order to create the next block. If you want to create a different kind of block instead, just click on the Menu on the left and choose a block type. Want to add a block in between a existing text block? Just put your cursor where you want to place the new block and hit the Enter ⏎ key. To insert any type of content just press the Menu button on the left. This will open a menu of all the available content types. Simple select the type you find most suitable to insert it into your document. You can also use this menu to change content type for a certain block or to remove a block, using the little cross button. Some types of content now have Meta-settings, these are mostly used to alter the way content is displayed. For instance for the title block you can now choose the size of the title (h1, h2, h3) by using the meta-settings controls. To trigger the meta-settings controls, just click on the content you want to change, if it has any settings they'll be shown on top as a little black control element. That's all for now, we'll update this article as the freeform editor evolves. Make sure to let us know if you run into any issues or if you think something is unclear: hello@pr.co.